You’re probably here because you’re thinking about wearing your baby, or maybe you’re already wearing your baby but want to see what else is out there…… Great! With so many brands and different products around it might seem impossible to choose the right thing for you and your child. Ask friends or other parents what they prefer and you will get tons of different answers and you’ll probably be even more overwhelmed. I will try to give a short overview of the different products around, hoping to help you with this decision! It can be a great idea to try a carrier, wrap or ringsling before you buy one. Try to find out if there is a sling meet or sling library in your area, or look for a babywearing consultant who has the carrier you want to try. A ringsling is a piece of fabric with two rings sewn on one end. 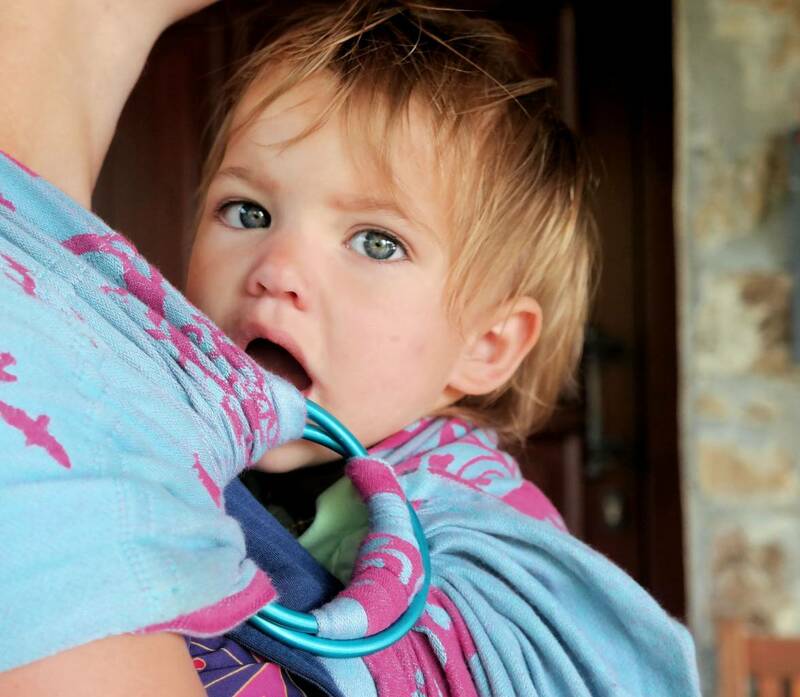 Most ringslings are made with woven fabric, but there are also ringsling with jersey fabric or fabric that’s suitable for use in the water/shower. A ringsling made from a woven wrap can also be called ‘WCRS’ wrap conversion ring sling. There are different shoulders styles available, some are padded, some are pleated, but the most commen style is called gathered. You will also find the ringsling in different lengths, to suit every body shape. As your child gets bigger you will also need a bit more length. Regular length is mostly around 1.75-2m (measured from the rings to the shortest end of the ringsling and will suit most parents. 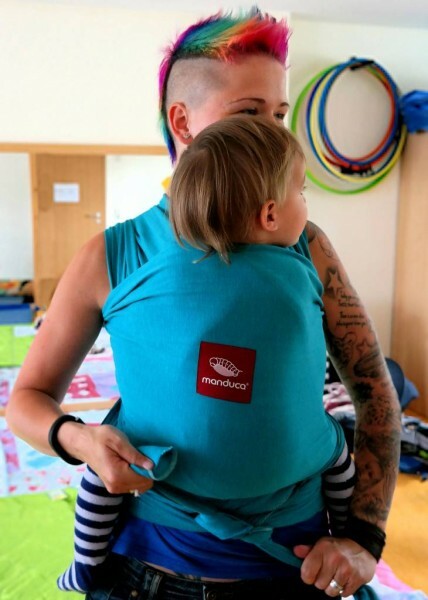 As you can see on the picture a ringsling is worn on one shoulder, you can position your child on your belly, on your hip or even (for more experienced babywearer) on your back. – asymmetrical, the weight of your baby will be on one shoulders. As your child gets heavier it’s less suitable for longer walks. The fabric from a stretchy wrap is totally different than a woven wrap, it feels more like a t-shirt and the stretch feels very strange if you’re used to wrapping with woven wraps (like I am). I did get used to it after a couple of tries though. 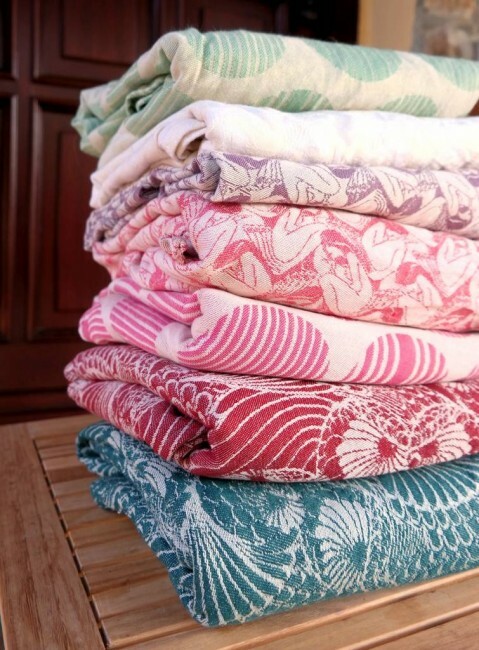 T-shirt fabric mostly stretches in multiple direction, as a stretchy wrap stretches in only one or sometimes 2 directions. The combination of stretch in one and no stretch in the other direction is what makes different brands unique. Is there a reason to start with a stretchy instead of starting with a woven wrap? Maybe. Most mamas say it’s easier to start wrapping with a stretchy and they love the pre-tied carry, but I think with a stretchy wrap it’s even more important to understand how to tighten a wrap properly if you want to carry your baby very comfortable. You need to wrap very tightly and tightening a wrap with a lot of stretch needs some practice just like tightening a woven wrap. The most important reason for me would be the ‘snuggly’ feeling you get with this wrap. I can only imagine how nice it would be with a small newborn baby, for skin to skin contact. It feels almost like a second skin. 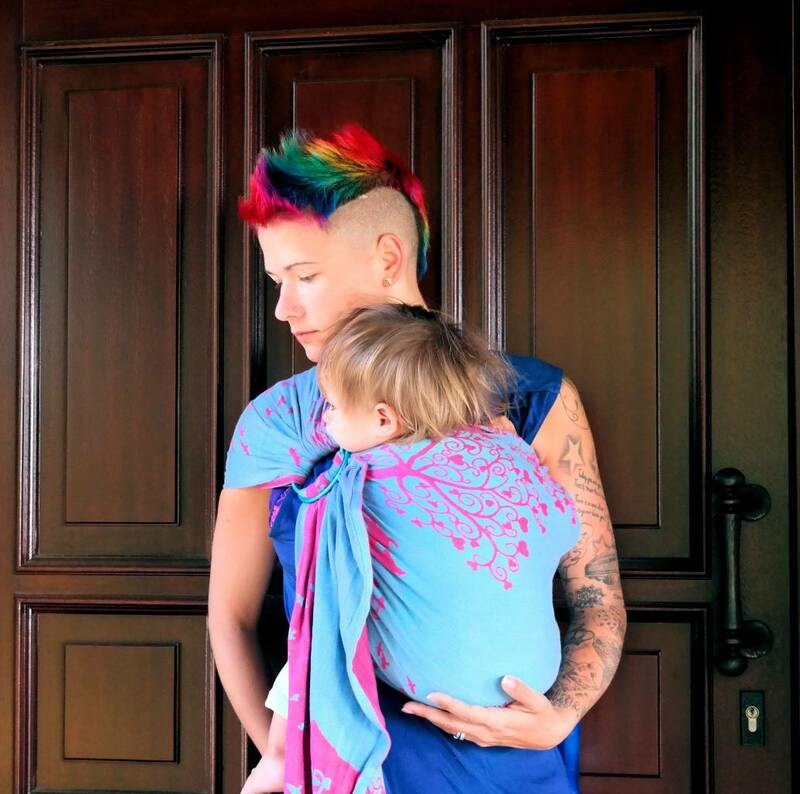 A woven wrap is a length of woven fabric you wrap around yourself and your child to carry it in different positions. It’s the most versatile option and will suit every body size (depending on the length). 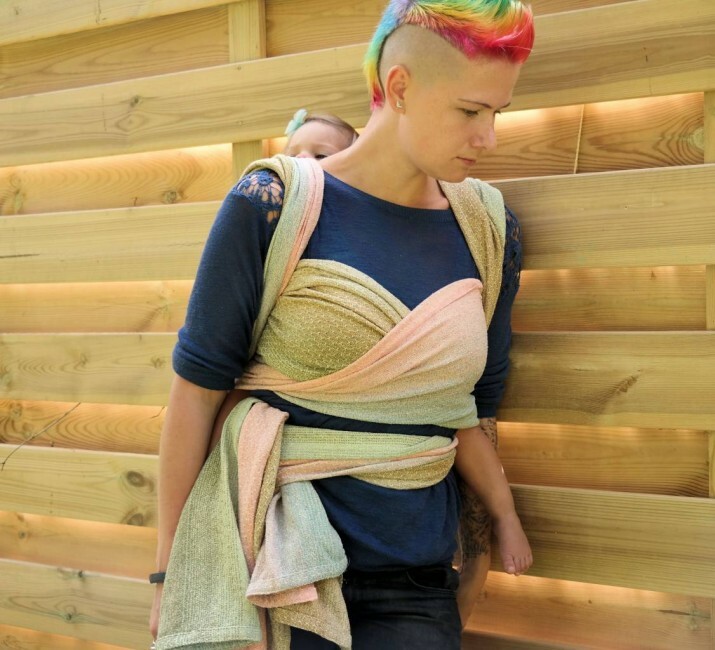 Wrapping might scare you off and will definitely take some practise, a babywearing consultant can help you out if you’re afraid to try it alone. Choosing a wrap might be even harder than choosing a nice pair of shoes. So many brands, different materials and different sizes! Depending on your body shape (and how big your child is) you might need a longer wrap for some carries. There are carries for every situation, choosing a carry that suits your child’s development stage, weight and your own preferences will be a process of trial and error. You need to learn what doesn’t work for you, to find your favourite carry. As your child grows, your preferences will change. A babywearing consultant or visiting a sling meet can be very helpful. A sling meet is a great option to try different brands and sizes. 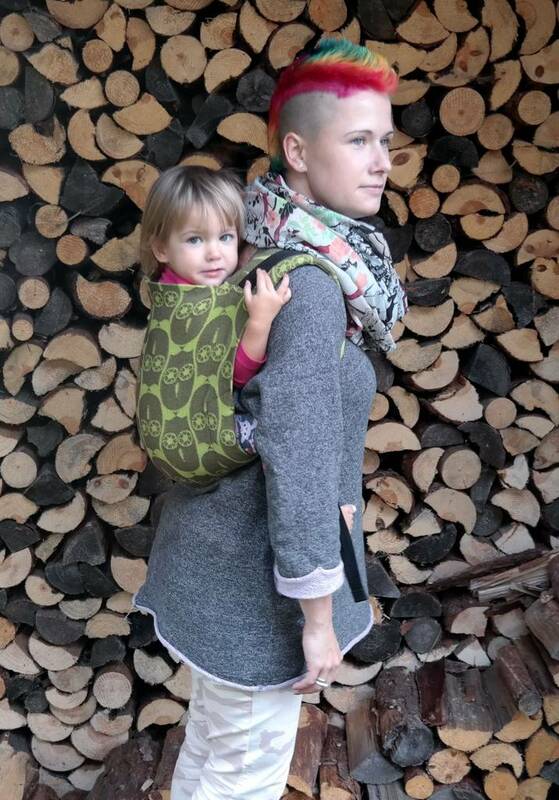 – learning how to wrap takes practise, you might prefer to get some help from a professional babywearing consultant if you want to learn backcarries. A full buckle is a carrier with buckles on the waist strap and with ‘backpack-like’ shoulder straps. You don’t need to tie anything, just buckle up and go! It’s very easy to use. There are different sizes and features. Some carriers have pockets, sleeping hoods, leg padding, are adjustable in height and width… Some are made with wrap fabric and there are also converters out there that can make a custom carrier for you! You will need to choose a size that fits your child best, don’t buy a bigger size for your child to ‘grow in to’, the carrier should support from knee to knee without overspreading the legs. With bigger children it’s not horrible if the carrier doesn’t reach from knee to knee anymore, but there are some great pre-schooler carriers around to fit even your 4 or 5 year old! 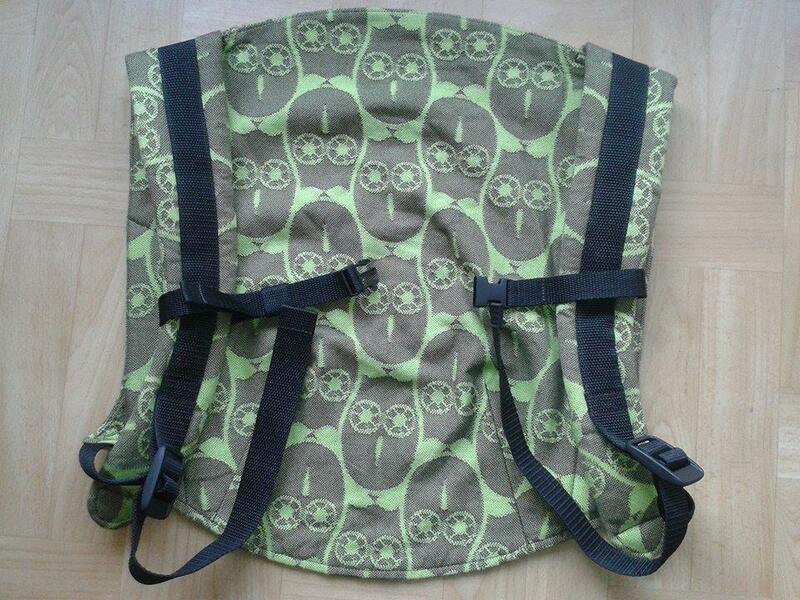 The shoulder straps allow different ways to tie the carrier, which make it easier to find a carry comfortable for you. Just like the full buckle there are carriers in different sizes and with different features. 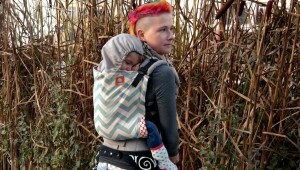 Some carriers have pockets, sleeping hoods, leg padding, are adjustable in height and width… The shoulder straps can be wide so you can spread them, more narrow and padded, or a combination of both. Some carriers are made with wrap fabric and there are also converters out there that can make a custom carrier for you! Some carriers can be adjusted in the width and will grow with your child. 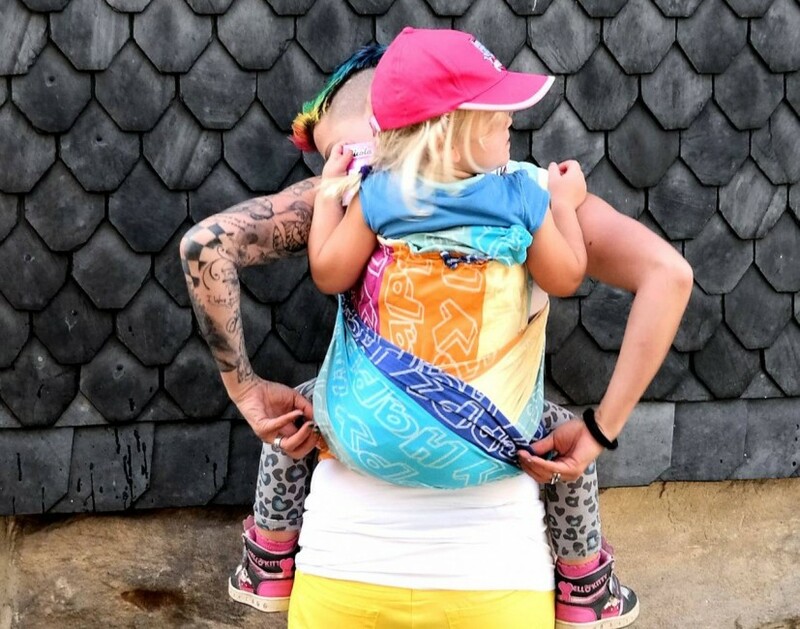 With bigger children it’s not horrible if the carrier doesn’t reach from knee to knee anymore, but there are some great pre-schooler carriers around to fit even your 4 or 5 year old! A mei tai consists of a rectangular piece of fabric with four straps at the edges. It’s an Asian style carrier, you need to tie the straps. It’s a nice combination of the ‘ready to go’ style of a carrier, with the versatility of a wrap. 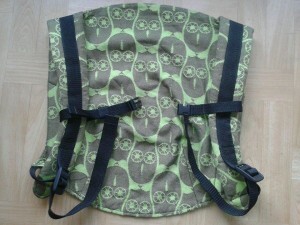 The straps allow different ways to tie the carrier, this carrier will fit different body sizes and allow fancy finishes. Just like the other carriers Mei Tais come in different sizes and with different features. 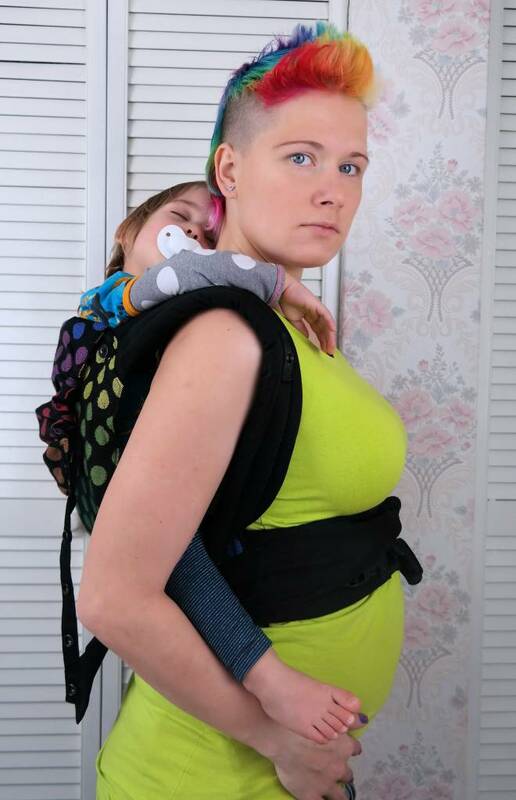 Some carriers have padded straps, sleeping hoods, leg padding, are adjustable in height and width… The shoulder straps can be wide so you can spread them, more narrow and padded, or a combination of both. 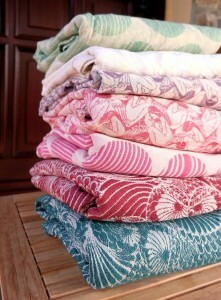 Some Mei Tais are made with wrap fabric and there are also converters out there that can make a custom Mei Tai for you! You will need to choose a size that fits your child best, don’t buy a bigger size for your child to ‘grow in to’, the Mei Tai should support from knee to knee without overspreading the legs. Some Mei Tais can be adjusted in the width and will grow with your child. With bigger children it’s not horrible if the carrier doesn’t reach from knee to knee anymore, if the Mei Tai has wide straps, you can usually spread them out to support the legs (shown in the picture above). I wouldn’t recommend them for a frontcarry. 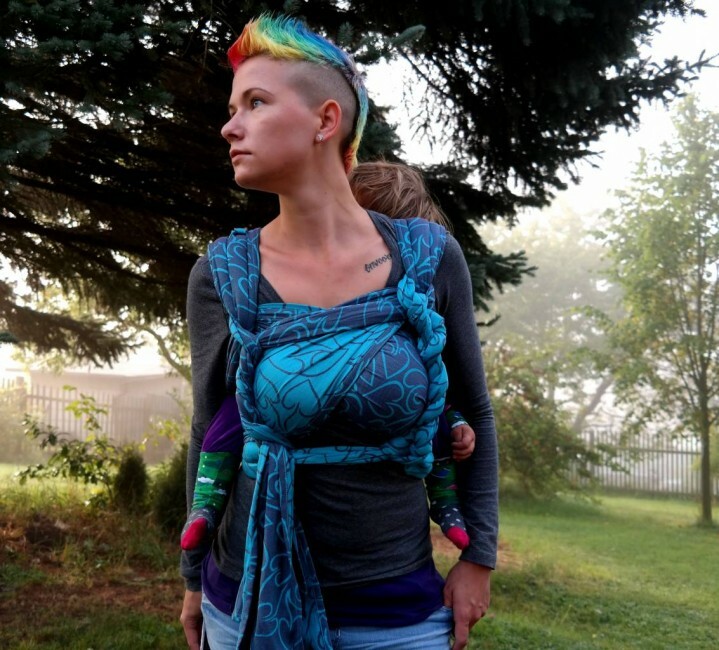 Yes, it’s possible, but it’s close to impossible to wear your child high enough in a frontcarry. It’s VERY important to wear your child high in a onbuhimo. If you wear your child too low, the pressure on the neck increases. Like the other carriers, you need to make sure your child fits in the carrier perfectly. It’s best to wear your child high enough so he/she can look over your shoulder. A onbu can be a great choice during pregnancy and I really love it for tandemwearing. It’s easy to put on your back and the lack of a waistbelt is great for those situations. Compared to other carriers it’s heavier on your shoulders, with other carriers the weight will be distributed along your waist too but here all the weight goes on your shoulders.